Today I get to tell you about another company I had never heard of until I saw them pop up on the upcoming vendor list for the TOS Homeschool Crew. 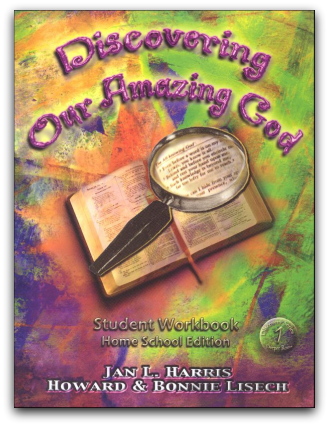 Deeper Roots Publications has Bible study materials that are intended for jr. and sr. high school -- along with material meant for mom. We had the opportunity to review the first title in their 4 volume set, which is intended for 7th-9th grades. These books can be used for a full-year study over four years, or each could be completed in a semester, followed by Rooted and Grounded, their high school course. I intended to use this with William, who is in 7th grade, figuring I'd need to adapt a little for him as far as reading and such goes. When I got the materials, I sat with the Teacher's Guide, which is listed as being a "Home School Edition." It still seems to be written to a classroom setting, however. In looking it over, I determined that I really wanted to have a little more interaction... so Connor (9th grade) was invited into the study. I also decided that for our home, we did not need the Student Workbook. In addition, there are seven pages throughout the book that talk about Unreached People Groups. We found a number of things we really, really liked. We found some things we didn't particularly love. The great part was the conversations we were able to have as a result of working through the book. I'm really glad I pulled Connor into the class as well, because the discussion was far richer with more involvement. We got into all kinds of issues in these conversations, and it was great. My kids rolled their eyes at me big time, though, with questions such as "Today we will finish the story of Esther. How do you predict it will end?" They also took issue with the first statement in the discussion for after reading Esther 8:3-17 -- "The story doesn't end exactly as we would expect..."
My kids told me that we have read or studied Esther so many times they simply could not comprehend expecting an ending that was different than what we read in the Bible. And they have studied ancient history enough to not have expectations that a law could be overturned simply, or anything like it would be today. I had to do a lot of pointed questioning to get them to think in terms of "how would you expect the story to end if it was set in modern times?" There was, however, nothing in the teacher's notes to direct me towards helping them to grasp this. The not so great part was how "school-y" this all felt. Suggestions to invite in a guest speaker, or for decorating the bulletin boards... these made me feel that this wasn't a great fit. There was a fair amount that I needed to skip over, as I'm just not going through that kind of effort. I do like the study though, and we will consider more volumes. However, I will plan to purchase the Teacher Book only, as I just don't see my kids using the student books. What would be great would be to do this in a small group or co-op type of setting. I think my kids would put a lot more into some of the paper writing and research if it was in a class setting. If you are interested in seeing the materials, you can visit Deeper Roots and give them an email address to get a pdf sample. I did that, and did not continue to receive emails. The Teacher's Guide is available for $28.95, and the student book is $19.95. Disclaimer: As part of the TOS Homeschool Review Crew, I did receive this set in exchange for my review of the product. All opinions are my own, and receiving complimentary products does not factor in to my opinions. For more about my take on reviews, visit my blog post here. I love when we use a product that will generate discussions in our house. And I also get more input from the kids if more than one child is involved.